I recently decided to check through all of my nail varnishes to see what colours I already have. I often lust after new nail varnishes but I'm usually never quite sure if I already have one that is pretty much exactly the same shade. So to make it easier to see the shades I have at a glance I’ve made a colour wheel for each colour. As I’m doing this I thought I might as well do a series of posts showing the nail varnishes and shades I have in my collection. Curtain Street is one of a few matte shades that Nails Inc released a couple of years ago. I don’t believe these were very popular as I picked this up when it was on sale and there’s only one shade still available on the website. The problem with this is that you can’t apply a top coat over the top because it would then no longer be matte and because of this it lasts no time at all. I now have a matte top coat which means I can make any shade I own matte, so I think I’ll probably be getting rid of this one. This came in one of my Glossyboxes a few months ago. I actually received a really dark shade and arranged to do a swap with another subscriber through the Facebook group for a lighter shade. However, I’m really not keen on this shade and have never actually used it so I think I’ll also be getting rid of this one as well. As you’re probably aware this one is a recent release and as soon as I saw it appearing on posts I knew I wanted to give it a try. I kept looking at it in one of my local Boots stores but I was slightly concerned that even though there was a couple of rows of the same shade the colours in the bottles actually appeared slightly different. These were directly under some quite warm lights on the display so I wondered whether maybe this was affecting the formula (I don’t know if this is something that might happen?). In the end I picked this up as part of the buy 1 get 1 free offer. I gave it a try and was really quite disappointed with it. It didn’t appear to apply very well, maybe because it’s a pastel type shade, and I just didn’t really get on with. However, after painting it on the wheel I really like how it’s turned out so I will give it another go. This is a mini size varnish that came in one of my Glossyboxes. I was actually really pleased to receive this because I’d had my eye on it for a while. This is a neon pink shade, but not as neon as Models Own's new Ice Neons. I quite like the mini size Nails Inc varnishes because they’re cheaper so you can try out a new shade without splashing out too much. Also to be honest, unless I love a shade I never finish a bottle of varnish before it goes off or I get bored of it! This was my first Illamasqua nail varnish and I picked this one up in their January sale for just a fiver. This is a fabulous bright fuchsia pink and is amazing quality and I now have a bit of an obsession with Illamasqua’s nail varnishes! Ouija is one of Illamqsqua’s newest shades and is part of the Paranormal collection. This is a beautiful shimmery pink shade which is one of my favourites across my whole collection. I posted about this shade here. This was one of three nail varnishes I received in a goody bag when I attended a gala performance of The Lady Boys of Bangkok. Barn is a deep pink which contains shimmer. 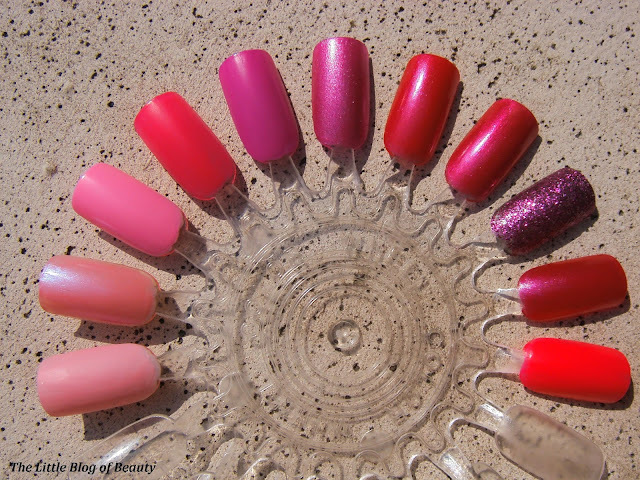 I posted about the Bad Apple nail varnishes I received here. I picked this up at the Clothes Show Live as part of a goody bag which I believe cost £10 and included your choice of two nail varnishes and various other makeup items. This was really good value considering how much came in the goody bag and that the nail varnishes are £5 each. This shade is actually very similar to Barn but is a slightly deeper pink. This was the other shade I picked up in the Clothes Show goody bag. This has come out quite purple on the photos but this is definitely a dark pink shade. I love this colour but wouldn’t wear it on it’s own as it would take too many coats to completely cover the nail so it’s best worn over the top of another colour. I applied three coats to the nail wheel and you can still see through to the plastic in some areas. This came in the goody bag I won from the #bootscamp Twitter party (you can find further details about the #bootscamp Twitter party here). I haven’t actually used this yet but it’s a very pretty pink that's similar to Barn and Blooming Pink and actually really does remind me of the jam in Jammy Dodgers! This is the newest addition to my nail varnish collection which I posted about a couple of days ago. This really is a neon bubblegum pink shade that is much more neon than the photos show. So those are the pink nail varnishes in my collection. Love this post you have some really gorgeous shades there especially the illamasqua shades they look beautiful! 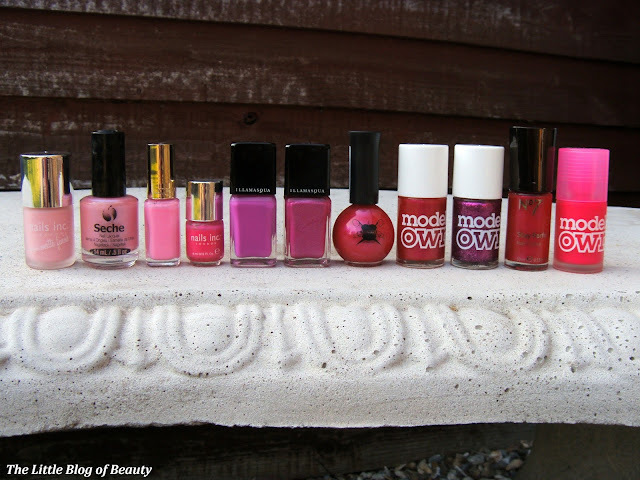 I adore pink nail varnish, all these look beautiful! Love these - especially Bubblegum. I love fun, bright colors!